The National Gallery is the national art museum located on the north side of Trafalgar Square. Its wide neo-classical facade faces south towards the square and Admiralty Arch beyond and the terrace of the central pillared entrance provides an elevated panoramic view. The museum houses a diverse collection of more than 2,300 examples of European art ranging from 13th Century religious paintings to more modern examples by Renoir and Van Gough. 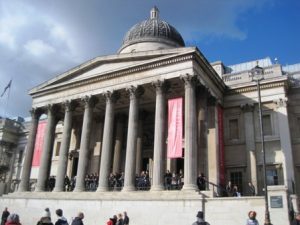 The older collections are accessed via the main entrance while the more modern works in the east wing are most easily reached from Trafalgar Square by a ground floor entrance. The modern Sainsbury Wing on the western side of the building houses 13th- to 15th-century paintings, artists include Duccio, Uccello, van Eyck, Lippi, Mantegna, Botticelli, Dürer, Memling and Bellini. Tthe main West Wing houses 16th-century paintings from the High Renaissance, artists include Leonardo da Vinci, Cranach, Michelangelo, Raphael, Holbein, Bruegel, Bronzino, Titian and Veronese. The North Wing houses 17th-century paintings, artists include Caravaggio, Rubens, Poussin, Van Dyck, Velázquez, Claude, Rembrandt, Cuyp and Vermeer. The East Wing houses 18th- to early 20th-century paintings, artists include Canaletto, Goya, Turner, Constable, Ingres, Degas, Cézanne, Monet and Van Gogh. The Gallery is open every day from 10am to 6pm (Fridays 10am to 9pm) and is free, but charges apply to the some special exhibitions.